I have a very old color television (yes, it has a tube) that finally gave up the ghost: the picture and channel-changing functions are fine, but now there is no sound (yes, I checked that the “mute” button is off). Here it is (the other stuff comprises a tuner and CD player for my nice speakers). There’s a round antenna and a digital converter box on top of the unit, as well as an effigy of Krazy Kat (Matthew Cobb, take note). 1.) What sort of television should I get? Everybody seems to have flat-screen t.v.s these days, and they provide a good picture and take up less space. But I don’t want to spend a lot of money, though I’d like a decent sized screen but not a GIANT one. I don’t want to put the t.v. on a wall. I don’t need fancy electronics and I despise thick “how to” manuals with complicated setups. I don’t want to spend more than about $500, which puts me in the “secondary television” market, i.e., the ones that regular people put in their bedroom (I don’t want one in there). I think one the size of my office computer (about 30-inch diagonal) would suffice, and don’t want anything larger than 40 inches. 2.) How do you get regular t.v. without cable? A friend tells me that all I need is a digital antenna, which doesn’t cost much, and with that connected to the t.v. I can pick up the non-cable channels. Any help or advice appreciated. I know I’ll surely get a diversity of opinions, but I can ponder them all. And remember: I don’t want to pay for television access! This entry was written by whyevolutionistrue and posted on December 9, 2018 at 8:45 am and filed under television. Bookmark the permalink. Follow any comments here with the RSS feed for this post. Both comments and trackbacks are currently closed. Last month, because my cable was out for a week, I was forced to watch the over-the-air channels. I was surprised by how many channels were available. Each “old” channel now has 3+ versions of itself: the normal HD channel plus a couple SD specialty channels. I would agree with the info above. You could go to the local Wal-Mart or, I think you said you are a member of Cosco? They probably have TVs as well. Living in Chicago you likely get many channels without paying a thing. Any TV you get today should be ready for the antenna (digital) that you need. I remember a few years back when people with the older TVs had to get a small device to add to the TV when the stations went digital. Yeah, that’s the box on top of my television set: the converter. exactly, you can throw that away when you get another TV. All of K Smith’s info is spot on. You don’t care about sharpness of picture, or how it looks when there’s a lot of motion in the image (like when watching certain movies or shows), etc. So you really just need to get the cheapest brand of a size that looks right to you. And has a good warranty. Usually sticking with the good glass makers like Samsung. LG and company get something that will last. I’d probably opt for the screen later technology but I think it’s all gone that way these days. It’s been a few years since I shopped for a TV. Yeah, the really low-tier brands are poor quality, but I’m assuming Jerry doesn’t use his TV much. I probably buy a new TV every year (not for the same room, of course) and I always get Samsungs. I’ve had nothing but good experiences with Samsung’s TVs over the years and their top of the line products are excellent. You might be able to put the output of the converter (set top box) into a PC monitor (if there is an HDMI) output on the box. If there is an audio output that can go to your HiFi or headphones. If that works, you could try getting a larger monitor. If that works, you can simply replace the converter with a digital TV recorder. The monitor (or TV if you buy one) should also work with a laptop or PC using a second input (HDMI) socket. You can watch video from Internet on a larger screen. Note that if you get a good picture with your antenna, amplifying the signal can actually cause problems. And remember: I don’t want to pay for television access! Agreed. I also add a PVR (personal video recorder, which has a hard drive) which is easy to set up to record interesting programmes that are broadcast at inconvenient times. I like Vizio, think it’s a good brand. I cannot tell what size your old t.v. Is, but you can find a 24” or 30” for around $100 this time of year. Yes, most new televisions will come with a built-in digital tuner so the converter box isn’t necessary. You can find a serviceable digital antenna for not a lot. I second the Vizio brand. I have an old vizio – it’s done OK but the sound has always been poor, not as clear as it should be. I would probably go so far as to say that all new televisions will come with a built-in digital tuner, at least in the US, given that all full-power stations are required to transmit a digital signal, and new TVs manufactured are required to have a digital receiver. Unless you bought something old (say on eBay), a new TV will almost certainly be LCD, and probably HDTV. There will be a significant increase in picture quality compared to an old CRT TV. I’ve never put a television on a wall. Mine came with a small stand that was easy to attach. I bought an LG for under $300 dollars earlier this year. Target or Walmart have plenty of inexpensive options. Is that not a digital antenna in the photo? My mom does not have cable and has something similar for her TV, though we have to adjust it quite frequently. I don’t exactly know where she got it, but I doubt it cost very much. There are a lot of TVs for less than $500. Here are some. You might want to add a sound bar since cheap TVs tend to have lousy audio. You can also connect your TV to the amplifier that feeds your pair of speakers. The built-in speakers in any television, even a large and expensive one, produce lousy sound. All flatscreen TVs *should* be able to take a regular wire antenna and receive broadcast TV channels in HD; the federal government required that a few years back. If you go buy a TV you could certainly ask the salesperson to show you how to set it up, but it should be as easy as plugging a wire into one of the ports in the back of the screen. Quickly looking on Amazon, I see a bunch of 32″ flat screen TVs for about $100-$150. But I’m sure you could find a smaller cheaper one at Best Buy or another similar electronics store. What about no “TV”? You could experiment with that for a bit. It’s interesting to try. Use the iPhone for videos. Is a hanging screen really necessary? A certain 12.9-inch high resolution tablet might be a better use of the funds. Bluetooth is also here to stay…. There’s also the over the air problem for conventional tv – you need an antenna and stuff. Wires. Never figured out how to do it. So long America’s Test Kitchen. Could also kick the can down the road and get something on Craigslist. Years ago I discovered that some radios have a tuner for broadcast tv channels, and you could play their audio over the radio. Very trippy to listen to classical Star Trek episodes on the radio while working in the lab. Radios can no longer play broadcast TV audio since TV is now on a different band and digital. In the old days, that worked because TV sound was transmitted as an FM radio signal. That’s an important distinction – the digital OTA channels. They either come or they don’t. It can make a channel unwatchable…. Actually thinking back, this was such a drag, getting chairs and trying to find the sweet spot, hypothesizing about clouds, windows, towers. FM radio is a small slice of the analogue TV spectrum, wedged between VHF channels 6 and 7. This is why FM radios in areas with transmitters broadcasting on those channels receive audio signals from those stations on the extreme ends of the radio dial. I remember a very old TV set we owned that had a continuous tuning dial instead of the fixed dial that only clicked on channels 2 through 13. The entire FM band appeared between channels 6 and 7. My father later salvaged the chassis of that TV and used it as a radio tuner in his basement workshop. This is just an example of a TV, there are a lot of good TVs in this price range actually. Might have to put the antenna in a window, or occasionally rotate for a specific tower, but you will pick up all the HD over-the-air channels no problem. Our first flat screen was a 37 inch lg. Costco should be able to help you out there. Costco have the best warranty. If you were getting a good signal on your old TV, you can keep your existing antenna with no problem. With the digital changeover there wasn’t a problem with the antennas, the problem was that the channels now transmit on a different frequency and older TVs were incapable of receiving and processing the channels on those frequencies, thus the need for the box. Any TV you buy now will be able to decode the over-the-air channels internally, all you need to do is plug in the coaxial cable from the antenna into the “Antenna in” part on the TV. You will be able to get rid of the box. 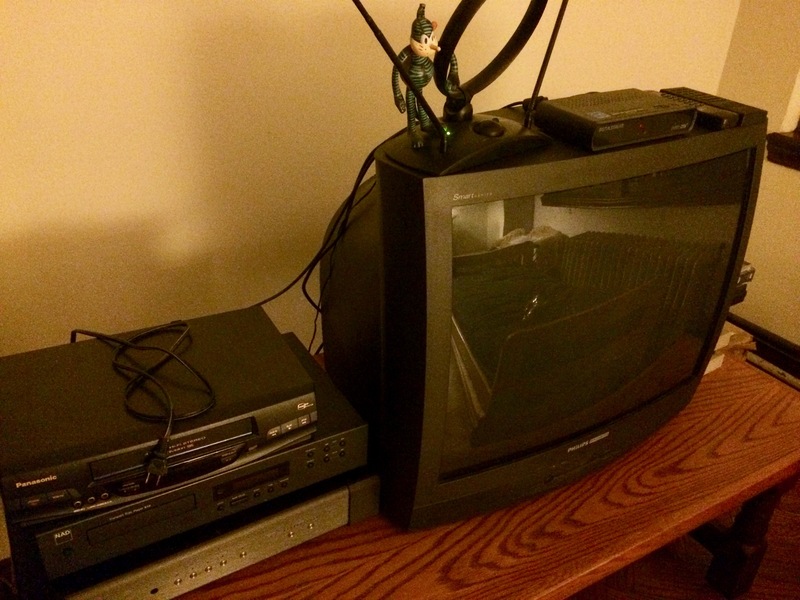 Note that your VCR probably will not work with the new TV. If your DVD player is not a progressive scan model it also may not be great either. Your search is an easy one. A flat screen TV with embedded Roku is the answer. They are inexpensive, come in a wide variety of sizes, have excellent resolution and can be connected to s wide variety of external inputs – CD/DVD, antennae, internet, satellite dish, commercial cable input (Direct TV, etc.). You can attain all of your goals with such a set. I have three and am very satisfied w/ their performance. Visit a Best Buy store and find a TV geek that can easily address all of the questions you may have. I’ve found several very knowledgeable sales reps at the BB located near me that were very helpful when I began hunting just like you did. Good luck, amigo, and happy holidays. Hi Dr. Coyne. You can definitely find TVs that are 40″ or smaller for less than $300, sometimes as low as $200 for a 40″ TV. HiSense, TCL, and SILO are all inexpensive brands with good HD image quality. You don’t need a 4k or OLED TV. Most new TVs will have an on board digital tuner that can search for digital signals from the networks. To boost the signal you can buy a Mohu Leaf digital antenna and run it from the TV coax and then mount the antenna on a window. That’s what I do and I get the 4 networks, several public television stations and some other nonsense. Jerry – I think a 32 inch flat screen would do well for you. It will SEEM huge. The TV should come with a stand so you do not need to mount it on the wall. Add an antennae and in an area as big as Chicago you would be good to go. Heck, where I live in Northwest Arkansas I was surprised how many channels we could receive via antennae. This should be doable for under $200. Some people get very hung up on brands, I would not. Honestly in today’s economy you have no idea whose factory built your TV, anyway. Check out Consumer Reports. Rather like drinking from a fire hose. But lots of info. Whether an antenna works depends on locality. So you won’t know til you hook it up. Be sure you can return it without penalty. Just as an aside on the subject, I know Dr. Coyne does not need or want pay TV. However, if you do have one of the standard pay methods of satellite or cable TV and wonder, witch one is better. I have had both over the years and cannot say. Have had trouble with both. Generally, cable should be more reliable as satellite goes out with the weather. Also, satellite is constantly updating things to keep up with the competition so you are always behind or being upgraded. They are both way over priced and just like with autos, you are paying for stuff you don’t need. Such are the trials and tribulations of the modern human in the Western world. I have it so rough. And speaking of internet, also getting more expensive all the time. The popular deal these days is to “bundle” internet and TV all together. What they mean is, it cost a bundle. My parents do this. They don’t have cable TV but they do have a high tower in their yard. They have a really good, fast internet package and they either watch HD TV over the antenna or they stream Netflix or AppleTV. Others I know also use the Android boxes which are sort of grey market I suppose but that gets them every imaginable channel. I cannot do such things because I live in a rural location that has high speed but not fast enough speeds down to really allow me to stream everything. I can do Netflix but just. If I were in a city I would do away with cable like my parents have. Ha, going back to a time before the internet and before TV was anything but analog with some kind of antenna – we lived 80 to 120 miles from any television station. We had the frame of a windmill tower on the garage, detached from the house. Instead of a windmill, a television antenna was attached to a long pole and a crank that allowed us to raise the antenna to about 90 feet. This let us receive the three channels out of Omaha, 90 miles away. Call it early TV from long distance. My current cat looked adorable furiously pawing at windows and mirrors. Then, during a nature show, he did the same to the flat screen TV. After several sessions I noticed the foam holding the screen in at the top was starting to work its way out. If/WHEN you get your beloved Bengal, do not let it paw at the flat screen TV. Flat screens simply can’t take the punishment that the old ones could. Given your modest requirements, don’t let anyone upsell you to UHD (ultra high definition) – which, of course, is higher priced. Normally, a 1080p (conventional) HD set would be recommended. But (again) in your case, a 720p would suffice – especially if your antenna only delivers a standard definition signal. (And 720p would be slightly cheaper). I don’t know anything about Chicago’s over-the-air HD availability. But if you want HD, you might have to swap your old external antenna thingie for a HD model – unless, as some folks are suggesting, these newer TVs have a built-in HD antenna. With even a basic antenna, there will be dozens of HD stations available in Chicago. It isn’t really a feature of the antenna. Do you have internet at home? If so you might check to see if the stations you want are available on the internet for streaming live over your computer. My guess is they are. If this is suitable and you can find stations you like on the internet you won’t need a television. I’ve connected the audio output of my computer to an old small Sony stereo so I can watch and listen while make breakfast, do dishes, etc. If you decide to get a TV ensure it has a tuner built in or else you won’t be able to connect an antenna. Many TVs today are sold without an internal tuner and you need to buy an external one. Another option is a TV with built in internet streaming via wifi or wired network. Again, assuming you have internet at home. But you would need to check that the TV allowed streaming of the stations you want. Because modern TV’s are very flat the speakers are often terrible, I’ve seen a couple TV/monitors that don’t have speakers, so you might want to hook up to your stereo and that would require having an audio out and a cable. This assumes you stereo has an aux in and it isn’t being used. I remember a time when buying and setting up a TV was relatively simple. Good point about the speakers. External speakers really help. I was going to recommend this as well. If you want a bigger screen you can use a computer monitor but I suppose getting a TV would be about the same price – might be worth comparing. I find there is a convergence between TV and computer that hasn’t been made clear to consumers even though it happened years ago. I use an OTA to get network channels and the image is actually better than cable because the cable feed is compressed whereas OTA is not. November’s Consumer Reports has the latest TV listings and as per usual LG and Samsung top the lists all under %500.00. You will enjoy your programs much more on a larger screen. Damn, looks like somethin’ a Chicagoan might be able to pick up Wayne’s World with on public access all the way from Aurora. Hi Jerry – We ditched cable some years ago and now use a flat digital HDTV antenna. It costs about 30 bucks. It is about 18 inches on a side and requires an electric outlet and a standard cable input jack on the TV. We have it taped to a window aimed in the general direction of the nearest city with broadcast TV stations about 30 miles away. It works well most of the time, however the picture breaks up occasionally based on the weather (I assume). We are happy with it and will watch the Bears beat the Rams this evening thanks to it. And since Jerry is near great lakes he may be situated high enough up to get even more channels. My parents do this across Lake Ontario but they are at a high elevation over most buildings etc. Since it’s just ‘talking heads’ TV that interests you, then a 32″, 720p resolution, LCD flat screen will do – around $110 to $150 on Amazon. Wire the audio to your HiFi via the TV headphone jack or use an RCA cable with two plugs [white and red]. If you buy a TV from a decent DEPARTMENT store or electronics shop then bring along a pic of the back & front of your HiFi so they can advise on audio cables. Should point out that the RCA cables that Micheal was talking was talking are basic RCA cables that shouldn’t cost you more than a few dollars in any case, but my point holds true. Ugh the glossy! I had to go look at so many TVs, when I replaced mine years ago, just to find a matte one and it wasn’t easy. My TV is across from a window so unless i just want to look at myself as a ghostly image in the TV fiction, matte was essential! you can use a tablet or phone to watch any available channel via online TV, when you are outside the house. At home you can get a large PC monitor (with HDMI sockets and audio), if you have not got one already. You could get one with an integrated tuner [a digital TV] but this is not necessary. See below). If, instead, you get a TV digital recorder, you can use this as the TV tuner displaying output through the PC monitor. Using the same monitor, you could receive/record TV, use your computer, display video from your phone. If you have a multi screen PC you could display internet TV on one screen and your PC programs on the other. Assuming the monitor has audio input, you can also input sound from TV tuner/recorder, PC or tablet/phone: otherwise you can plug the sound for any of those into your hifi or sound system. I have a digital radio (circa £50) with external speakers which receives bluetooth audio (from PC), aux socket etc. P.S. “Regular” TV (in the UK this is called Freeview) can be picked up by the antenna input on the Digital Recorder. This is connected to the ariel on the roof that (in my case) is years old and is the same as the old “analogue” antenna. You can consider an indoor ariel as well. There are loads of channels available (BBC, ITV etc) including radio channels. If you wanted cabled TV you might need a decoder box for that (depending on your subscription). Here is a good one under $200. If $500 is your upper limit, you should be able to get a fairly large flat screen unit. Several years ago, I got an LG 42″ from Tiger Direct (an onlune electronics firm) for under $300. It was not a refurb, and it was deliverred within two days. Although some people think a really big screen is extravagant, it’s really nice when you’re watching movies. One thing I always wonder is why so many computer monitors don’t have decent sound like TV sets do. I hate having to use extra speakers or headphones with my desktop, and the only monitors including audio have really bad sound quality. I guess I could just buy a TV set with a computer input. Oops…”online”, not “onlune” and “delivered”, not “deliverred”. I’m getting used to a new keyboard. It very well may NOT be you and your keyboard. There seems to be some “glitches” in autocorrect software that sneak in now and then…if I didn’t know any better (which I’m not so sure I do🙊) I’d say there are some crafty hackers behind some of the more amusing/frustrating malaprops caused therein. It’s especially bad with autocorrect if you are a quick typer because you have already moved on when it corrects the word and you don’t notice as it does it after you’ve typed the word as intended. Then hook up your existing antenna if you can. Or else you can buy a simple antenna that has a coaxial cable that will plug into this TV. No need for an amplified antenna. The real problem is trying to tell the TV exactly which of the 50+ channels you want it to ignore! First go to Antenna.org put in your location and this will tell you what channels you can get for free over the air at your location. Then go to Craigslist and get a nice working size T.V. for less than $100. Aset of rabbit ears for an antenna will most likely work. Regards Pat Orlando. My own TV is big and expensive, but I don’t use cable TV either (why spend thousands a year on that?) so I use a $30 digital antenna. I agree with other comments, any cheap TV from the store should work since they all come with tuners. The more important thing is where to put the antenna to get good reception. That sometimes takes some trial and error. Would you rather not have a flat screen TV? I hate the things, they’re full of bells and whistles and modern technology that I don’t know how to deal with. And Roku? Oh good lord, they got Roku at our local nursing home, and that stinkin’ thing is IMPOSSIBLE for an old fart like me to deal with when our friend wants to see Netflix via the Roku. We have a thrift shop nearby that has “Real TVs” (as I call TVs with cathode ray tubes). Is there a thrift shop near you where you can get a Real TV? LG or Samsung HDTV for picture quality. Consider Apple TV for internet TV. No manual, small intuitive controller. An abundance of choices. Youtube has tons of free lectures documentaries and movies. 32â class high definition TVs are usually under $150.00 including tax and a digital tv antenna box is under $30.00. However you may need outside antenna depending on the location situation of the TV. Our flat panel tvâs are old ones which are thick and heavy. Current flat panel TVs are very thin and much lighter. Costco in our neighbor hood have many Vizio models on display (Lincoln Park Costco) on Clybourn south of Diversey. One may buy a large size say 65ââ diagonal high definition QLED smart TV can be bought for under $2500.00 including taxes. Ideally a wall mounted TV saves space on the floor and most stores selling TVs sell wall or ceiling mounts for TVs and a good installation for such TV may costs upwards of $400.00 labor and repair of the wall/ceiling. Our old and heavy Sony flat panel TV installation in the Kitchen area required a special hanging mount which I bought from peerless industries I think is in Bollingbrook but now one can search them on web and order. I helped my daughters to have TVs installed on their walls in their small living rooms a 65â TVs years ago and one is still in the same apartment. Her TV is about 45â curved model. I donât know what is the benefit of curved shape. I have a guy I use to have this kind of work who can do all kinds of construction work. Bargain with them and ask for a second remote. Remotes wear out, the buttons you use to click eventually need more and more pressure to be effective. Getting a new remote that works on an old Tv can be difficult – universals are often not. My TV is ancient, replacing the remote was not easy – tho that may have changed. Federal law requires TVs to have a standard antenna input and tuner, so no worries there. There are far fewer “small” screen these days, and you should beware of buying one that only does 720p resolution, which is the case for many small screens. The POWER SAVINGS that you will make will pay for the new TV. CRT screens consume at least 10 times the power of an LCD flat screen. So unless you need the space heater feature do not rue the loss of the old tube box. The antenna that you have plugged in to the digital converter box can be plugged straight into the antenna socket of your new TV. I doubt that anyone can tell the difference between 1080p and 720p. Yeah. My eyes aren’t great but I think there comes a limit to how much we can discern differences in things like 720p and 1080p on a TV. I have never really noticed the difference myself. … the morning news as I’m getting dressed…. I misread that as depressed. Which is why I avoid the morning news. If your tv tuner has audio out connectors, you could just connect those to your sound system and get sound that way instead of from the tv. Then the problem is solved with a couple of cords instead of buying a new tv set. If your tv has multiple audio out/speaker connectors, you may find the alternates are still offering sound, and connect those to your sound system. Donate your TV to museum. Cheapest solution is go on craigslist and get one of the many free tube tvs. People are giving them away and upgrading to LED HDTVs. The only problem is they’re heavy. I’m still using a tube tv from 1989 with a digital converter. Like you I refuse to pay for cable. Tube tvs have much better contrast ratio than HDTVs. People love the big HDTV screens because they’re big and show detail but contrast is just as important for picture quality. *RF (aka coaxial, same connector type as antenna) poor resolution, noticeable lines on screen. many people use this cable because it’s what they’ve always used and because they don’t know they can get a much better picture with the cables listed below. *S video (yellow multipin) More lines of resolution and better color and contrast. I was using my converter’s RF output and switched to S video and the improvement was obvious. If you don’t want the hassle of moving a heavy tube tv I’d just get a smaller screen HDTV, much lighter and easy to move, no need to hang on wall. P.S. This solution has the benefit of reusing somebody’s old tube tv that would’ve ended up in the trash. for national and international news. for indoor use even cheaper ! Richard Carpenter – television special ! … … and at World Cup and Ice Hockey Leagues’ time ! Not likely that he can get Iowa Public TV although it is one of the best. Much better than the Kansas PBS we get in Wichita. Coo. What a load of advice!! I didn’t know so many people watched TV. Based on your viewing distance, a smallish TV might be just fine. But if you only watch standard definition channels, these will typically be displayed in the old, square (4:3) format. I.e., the image size will be smaller (cropped from the sides) than the screen size (16:9). So even if resolution isn’t a big deal to you, tuning in HD channels will enlarge the image and fill your (wide) screen. In Chicago??? I would wager that there are only one or two and those would not be interesting. All the network shows will be in HD. Well, the good doctor was watching a small number of standard definition channels (via antenna) on his old tube TV. And I was just warning him that those same channels will produce a smaller image size on a widescreen TV. Obviously, switching to their HD counterparts (assuming reception is possible/good) is the preferred option. Does your existing TV have an audio-out? (If there’s a SCART connector, there’s almost certainly an audio feed in that) Plug that into a pair of speakers, your existing amplifier setup, whatever. Prices of TVs are falling and capabilities rising at the same time, while new, incompatible standards appear (and disappear) regularly, so “now” is probably not a good time to buy, for any recent or near future values of “now”. If people stop trying to jam more (incompatible) capabilities into TVs to justify a temporary price increase, that might be a good time to buy, but I don’t see that happening soon. It is interesting that many folks above do not really answer your question regarding no cable and 25-30 inches. There are no 25 inch LCD TVs but there are 24 inch and the closest to 30 inch that is available is a 32 inch. Sometimes you can find one for $100 but a good brand in either size should be available this time of the year for between 100 and $200 dollars. Your old antenna should work just fine. In a tall building in Chicago you might get upwards of 40 channels in brilliant over the air HD with all of your desired options and then some. With luck you could reach your goal for $100. I suggest a smart TV. Costco will surely have a good discount, come Boxing Day. Their prices are reasonable to start with and I got an extra $100 off during Black Friday week. My 50″ Hisense is pretty good for the price but the sound seems less sharp than Samsung, Sony and LG. I hear the Vizio also has less than perfect sound. Costco has a 50″ Samsung Smart TV for around $550 that you would love. Get the biggest bang for your buck; you won’t regret it. I can even watch TV without my eyeglasses! Do check the customer reviews before you make your final decision, Jerry. (Wish we had done that instead of making an impulse buy!) A certain brand has got a lot of negative reviews, especially about their bad customer service! I love doing this kind of research. Comparing things in spreadsheets etc. That’s an excellent habit to have. I recommend writing or typing little notes down on a nice clean page, or computer program – costs, name brands – eventually every variable that is personally important down and add to it, creating a matrix. When I have done this, trends I couldn’t see become apparent, things I though were absolutely important diminish – even the variables can change. This approach is especially important when there’s all these little details than are new, and the products have changed so much. I think pencil and paper is best for this because it is there all the time, and the page gets filled out and you can see almost literally a picture of the whole game. Since speakers came up, and I threw in the word Bluetooth- I wanted to emphasize what this means. Bluetooth speakers can be so good you can hide it somewhere- like under a table, as it’s home. But it can go around the living area if desired. Additionally, it could be brought to work, or in theory in the car. This is a nice little aspect I didn’t think about before one ended up in my possession. Something to consider if going for an all-in-one product. Get a 55″ TV. Don’t bother with something as miniscule as 32″ or 40″, because 4K will do you absolutely no good with so few pixels. Make sure you get a smart TV. They are as much an advance in TV technology as color or flat screen, and are extremely user friendly and useful. You certainly don’t need cable these days. A decent antenna should pull in several local channels, and if you can mount one outside on a pole you should get a lot. I pull in 71 channels in the DC area. Other than that, get Amazon Prime, because then you can watch any movie you want, including lots of old ones you liked from the 60’s and 70’s, often free, or if not for the price of a decent chocolate bar. Prime is useful in a lot of other ways as well, of course. Netflix is worth the money, but IMHO mostly for its TV specials and series such as “Peaky Blinders.” (It’s worth watching at least one episode just for the theme song, “Red Right Hand,” by Nick Cave and the Bad Seeds.) You can get whatever else tickles your fancy, including an infinite supply of cute cat videos, and an amazing number of old TV shows, on YouTube. It has been said that the future of TV is apps. Whether you’re an Apple fan or not, it’s something to consider – especially when already paying for cellular. I’d love to know if the old TV can be repaired, especially by a “mom and pop” type shop – so not sending it to a factory in China. ^^^ that is the best link I can get. I don’t know if it’ll work right. But more and more I think the speaker in that TV ought to have a real easy fix for $30.